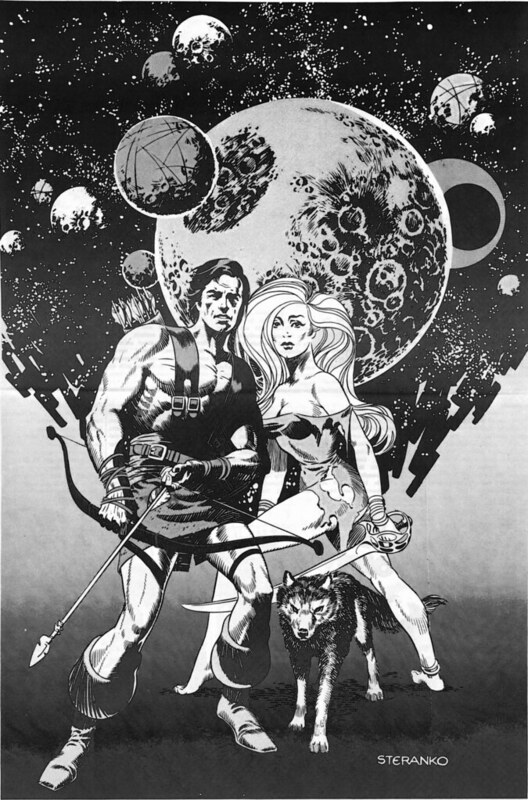 Giant-Size Geek: Jim Steranko: Interplanetary Warrior and Babe, aka Hunt Bowman! Jim Steranko: Interplanetary Warrior and Babe, aka Hunt Bowman! Barbarian sword fighters with laser guns is the craziest idea of all. But come on, who wouldn't want to see something like that? Jim Steranko sure would. Steranko drew this illustration for MediaScene magazine in 1974. No idea if this character is Gulliver Jones or Steranko's own creation. Let's hope that Andrew Stanton's John Carter Warlord of Mars movie will realize the dreams these images have provided. Nuff Said! Update: Blogger Britt Reid revealed that this character is actually Hunt Bowman, a Golden Age character who appeared in Planet Comics. See this article on Lady That's My Skull for more details. It's Hunt Bowman from the 1940s Planet Comics series "Lost Planet" about a Martian conquest and occupation of Earth in the future! Come visit us at Atomic Kommie Comics! You are right, it is Hunt Bowman! Thank you for filling in my Golden Age history gap and solving a 40 year old mystery.